Too many programs installed will cause the computer to be slow. Therefore, you need to uninstall programs that are not essential or unused. Here is how to uninstall programs on your computer. Click the Start button. Select "All Programs"
Find the folder and click on Internet Download Manager. Will open the contents of the folder. Click "Uninstall IDM"
Follow these steps to uninstall the existing. Most of the uninstall process in this way can be done by continuing to click "Next" on the uninstall. You do not need any tooling. Just click "Next", "Next", "Next", etc ... and the last "Finish" or "Close". Press the windows key and the letter R. It would appear the window "Run". Double click the program where you want to uninstall. Follow these steps the uninstall. Just like the first way, you just click "Next" and "Next". This method is the most complicated. But do not worry, you can definitely do it. :) Although complicated, the program will be uninstalled in this way is really clean not left on your computer. Unlike the above two ways that will leave remnants of certain files. Besides, this way you can also see details of the program as described in the second. And one more advantage, this method can uninstall stubborn programs that do not want to be uninstalled with normal way. 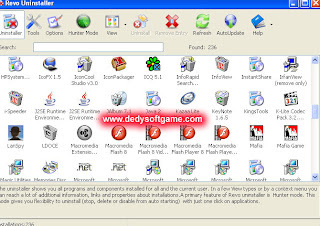 There are many options available applications uninstaller. Here I pointed out how to uninstall programs with Revo Uninstaller. 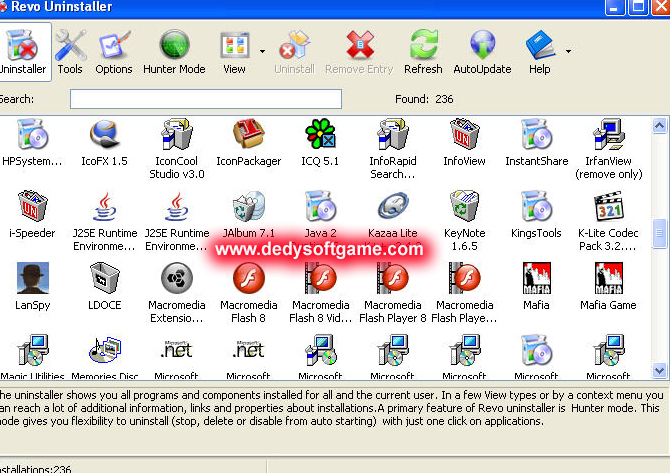 Make sure you have downloaded and installed Revo Uninstaller. Here are the steps. In the main window (Figure 6), you will find a list of programs installed on your computer. (See red box). Double click on the program you want to uninstall. After a double click, Revo will run the uninstall process early. Do not forget to click "Advanced" in "Scanning modes". After the uninstall process is completed, click "Scan" [which is now yellow] button next to the "Cancel" (see Figure 7). Let Revo scan files residual program. If there is a registry entry that needs to be cleaned, it will pop up a window like Figure 8. In the window, just tick the bold part, and click "Delete". If you are one of the check, there would likely be an important registry entry is deleted. The effect? There may be interference on the computer. Whether it was a noticeably or not. After removing registry entries, click "Next"
If no registry entries to be cleaned, or after cleaning the registry, it will display a window similar to Figure 9. In this window, give a check on everything and click "Delete". This step serves to remove all the folders created by the program. Click "Finish". The uninstall process is complete.